The Dog Days of August! Congregational social event – 2 Wednesdays on August is designed to get everyone together for a light supper and for a presentation by a dog-based service organizations in our community so we can learn about what they do. Come meet other members, non-members that attend our church! Get to know them for this fun event. 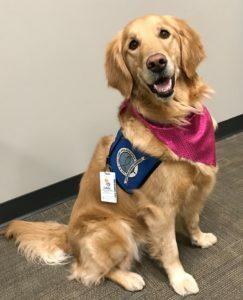 Launched in August 2008, the Lutheran Church Charities K-9 Comfort Dog Ministry is a national human-care ministry embracing the unique, calming nature and skills of purebred Golden Retrievers. THE LCC K-9 Comfort Dogs are a bridge for compassionate ministry, opening doors for conversation about faith and creating opportunities to share Mercy, Compassion, Presence, and Proclamation of Jesus Christ. Cubby has been deployed nationally, along with other LCC K-9 Comfort Dogs from throughout the United States to Orlando, FL; Las Vegas, NV; Parkland, FL, and Santa Fe, TX, in times of crisis to bring comfort and hope to those hurting and in need. Wednesday, August 8th, come hear Top Dog, Bonnie Fear, a handler for the LCC K-9 Comfort Dog Program. Ans YES, see Cubby! Brian’s public service career began in 2003 as a volunteer firefighter. He began working with his first bloodhound in 2008. He and co-founder Frank Hurst formalized Bloodhound Man-trackers with a vision to provide a valuable asset to ALL law enforcement agencies for tracking, Human Decomposition work, and to help find the lost & missing. 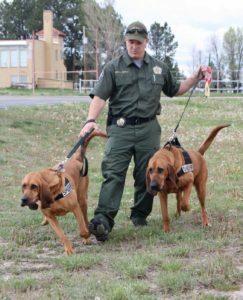 Brian has assisted over a dozen law enforcement agencies on dozens of cases and has numerous training hours in Bloodhound trailing and human decomposition work. He is proud to be a member of NecroSearch International, a resource for the National Center for Missing and Exploited Children and a Canine Search Specialist for FEMA’s Colorado Task Force 1 Search and rescue Team. Wednesday, August 15th, come hear Brian Everle and his Bloodhound in a presentation about the Bloodhound program and how it helps all law enforcement agencies!